Dandruff occurs due to a dry scalp, a skin condition known as seborrheic dermatitis, eczema, psoriasis or an overgrowth of a fungus called malassezia. People are prone to dandruff due to poor hair brushing and shampooing habits, dry skin or an improper diet. Stress also leads to dandruff. Chemicals in shampoos such as zinc pyrithione, ketoconazole, selenium sulfide and coal tar, salicylic acid etc., help in treating dandruff. But the best way to treat or prevent dandruff lies in your kitchen pantry. Treat dandruff using chemical-free methods and keep your tresses looking healthy and shining! Warm a mixture of equal quantities of coconut oil and lemon juice and gently massage your scalp with the mixture. Leave it on for about 20 minutes and rinse your hair using a nourishing shampoo. Soak fenugreek seeds overnight and crush them to a paste the next day. Apply on scalp and leave it on for an hour. Wash off with a mild shampoo. Apply curd on your scalp. Rinse off with a mild shampoo after an hour. Rub a spoonful of baking soda on your wet scalp. Wash off after one or two minutes. Apply a few drops of tea tree oil on your scalp evenly and wash with a mild shampoo after five minutes. Apple cider vinegar is very effective in treating dandruff. Mix equal parts of this with water and let it stay for a few minutes. Wash your hair and apply this mixture on wet hair. Massage well and leave it on for 15 minutes. Rinse off. A combination of henna and lemon juice is good for treating dandruff too. Mix henna with a few drops of lemon juice. You can also use curd or tea liquor instead of lemon juice. This mixture has to stay overnight or at least for eight hours. Make a paste of neem leaves in a blender and apply on your scalp. Wash off with water after ten minutes. To get rid of dandruff and improve hair health, you can try multani mitti. Make a paste of multani mitti, water and a few drops of lemon juice. Apply on scalp and hair and leave for about 20 minutes. Rinse off with water. In a blender, place orange peel and a few drops of lemon juice. Apply this paste on your scalp and let it sit for half an hour. Wash off with a mild shampoo. Soak 10-15 reetha or soap nuts overnight. Grind them the next day with water and strain. Mix with amla juice and apply on scalp for a half hour. Wash off with a mild shampoo. Massage aloe vera gel bought from a drugstore or that obtained fresh from an aloe vera plant on your scalp, ensuring the scalp doesn’t have oil. Sit for 30 minutes and wash with a mild shampoo or plain water. Rub crushed garlic on your scalp. You can mix a little honey to control the garlic odor. Wash as usual. Massage a few drops of olive oil on your scalp and cover with a shower cap. Leave overnight. Shampoo as usual in the morning. 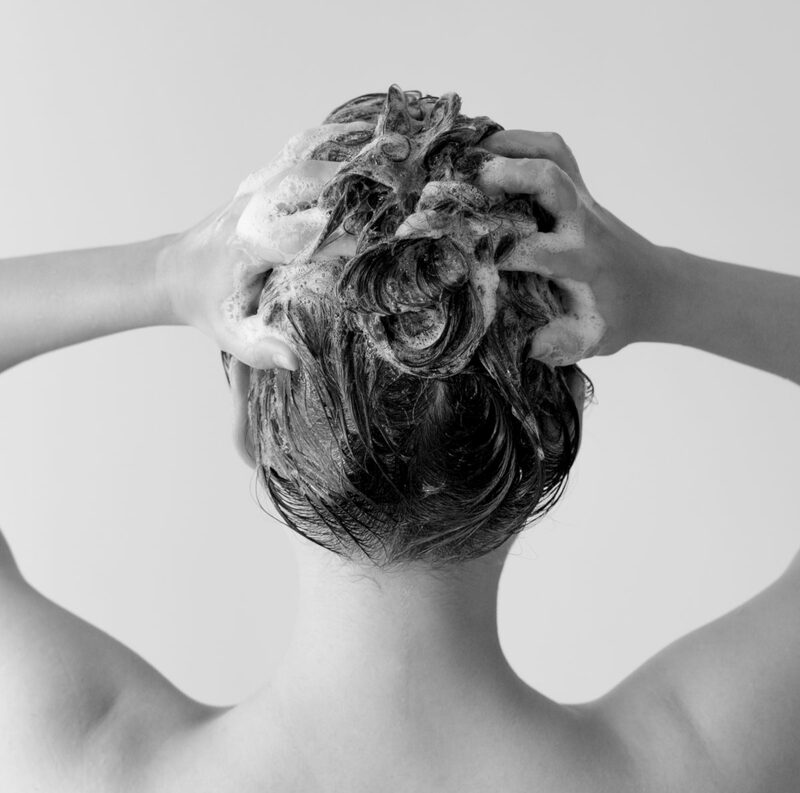 If you don’t mind chemicals, crush two aspirins to a fine powder and add it to your shampoo each time you wash your hair. Leave it on for a couple of minutes and rinse well. Wash again with plain shampoo. Rubbing salt on your dry scalp also works wonders. Give a good massage and work it through your hair too. Shampoo after this. You can also rinse your hair with an alcohol-based mouthwash after a regular shampoo and follow it up with your regular conditioner. The anti-fungal properties of the mouthwash help prevent dandruff. You need to repeat whichever treatment procedure you choose at least three times a week for good results.